A shower enclosure is a great idea – not only does it allow some privacy whilst taking a shower, it also ensures the rest of the bathroom remains dry and clean. What’s more, a stylish shower enclosure adds a touch of style to the bathroom and raises the value of the house. 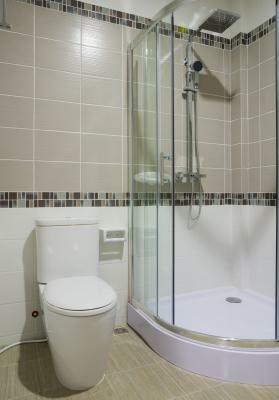 However, with all the different styles of shower enclosures on the market, it can be hard to choose. It’s not just about looks, after all – it’s also about saving space and creating that perfect fit. The shape of the shower enclosure can make a big difference – and when it comes to both aesthetics and practicality, the style of the door can make a huge impact as well. Looking for a shower enclosure but not sure which to get? Here are the shapes and door styles you should consider. It’s the easiest to picture, and this classic, clean look works especially well if you like to keep everything straight and angular. It provides a great showering experience in terms of well-defined space, and it’s easy to install. These are very well designed and lend the bathroom a more modern, smoother look. It’s a great way for saving space, especially when you install a sliding door. It’s also easy to install in corners. This, like the curved enclosure, is meant to save space and is easy to place in a corner. The angular design lends itself to both classically designed and modern bathrooms. The doors are centred for easy access and optimisation of available space. They come in a variety of price ranges and are perfect when you’re trying to save space; make sure there are waterproof seals before purchasing a unit. Pivot doors open outward in one smooth motion and are also designed to fit smaller spaces. Because the hinges are so small, they offer a very clean and modern look. Hinged doors are usually installed on neo-angle shower enclosures, and can be installed to swing in- or outward. The best way to choose the shape of your shower enclosure is, of course, to take the measurements and to see what fits. Once you’ve decided on the available space, the shape itself is a matter of style and how it fits with the existing décor of the bathroom. Remember, however, that you may be able to install a shower enclosure that is a little larger than originally planned if you choose the right door – the sliding door, for example, is an excellent space saver. Choosing that perfect shower enclosure is sure to brighten up your bathroom and add to the value of your home for years to come. Previous Post: Previous post: How Can I Prevent Termites in my Home?